chmartz Inc. may be a new company, but they’ve already managed to create a name for themselves in PlayStation 3 accessories through a range of remote control solutions. They’re the only source in this roundup to offer both an economical infrared-to-USB converter, the PS3IRX, as well as two more advanced infrared-to-Bluetooth versions, the PS3IR-1000 and PS3IR-500. Priced at $99.95 the PS3IR-1000 is an upgrade from the previous PS3IR-PRO model and doesn’t skimp on advanced features. For those on a tighter budget, the simplified PS3IR-500 can be had for $39.95, making it the least expensive complete solution in our roundup. We’ll first take a look at the PS3IR-1000, and then finish up with the PS3IR-500. A running trend with these adapters is their compact size, but the PS3IR-1000 takes that to the next level with a footprint smaller than a standard business card. It measures 3.25” wide, 0.60” high and 2.02” deep (8.3cm by 1.5cm by 5.1cm), and looks something like a small pillbox. The front features a slim plastic shield hiding the infrared receiver and the infrared transmitter, while on the back are three closely placed ports. The first is a 2.5mm headphone jack labeled “PS”, which in this case stands for “Power Sense” and not “Power Supply”. The second is a standard mini-USB port used for both supplying power and communicating with a PC. The third is a 3.5mm headphone jack labeled “IR” for external infrared input. On the top of the unit is a status LED that creatively illuminates the Schmartz light bulb logo. The only way to power the PS3IR-1000 is through the USB port, and the standard package includes a USB cable that can be used for this purpose. Anything with an always powered USB port will do, such as some set top boxes, but alas this doesn’t include the PS3. If no such device is available you’ll need to purchase an AC-to-USB adapter from another source. Setup of the PS3IR-1000 is done through the downloadable PC program, which has a particularly low system impact thanks to the adapter using standard Windows drivers and the application lacking a formal install option (and instead merely extracting to a folder). 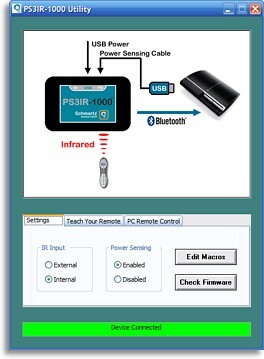 The software’s main interface features a large pictorial representation at the top of how your PS3IR-1000 should be connected given the settings at that moment, with three tabs below different functions. Power monitoring, custom macros & more. The first tab contains basic device settings. Here you can switch between using the internal infrared receiver, or the external input jack if you want to hook the unit up directly to an infrared distribution systems or an RF remote’s basestation. This is also where the PS3IR-1000’s power monitoring feature can be enabled. The PS3IR-1000 offers hardware-based monitoring of the PlayStation 3 via the “PS” jack, using a custom cable that has a normal USB type “A” plug on one end and a 2.5mm headphone jack on the other end. A premade cable can be purchased for $10, or assembled by the user. 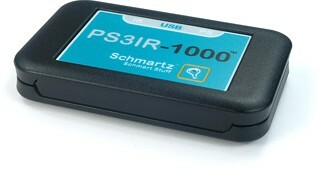 As the PS3 only supplies power to its USB ports when the console is running, the PS3IR-1000 can use this to know whether the console is really on or off. When the console is off, the adapter refuses to respond to the [Power Off] command, thus preventing a second run of any system shutdown macro from turning the console back on. Only when the [Power Off] command is received and it senses that the PS3 is on, will it transmit the stored shutdown macro. Hardware-based status monitoring such as this helps greatly with advanced remote controls, since it prevents automation macros from becoming completely out-of-sync even if someone uses the console manually. For those without the cable, an alternate variable-based tracking option simply prevents the [Power Off] macro from working more than once in a row, keeping a recently powered off system... off.